A reliable car that can be driven for a long time. A reliable, functional make of car. Good gas mileage considering its age. Drives and accelerates similar to other cars of its year and size. Does not have any recurring problems that would be expensive to fix or replace. Seats are comfortable enough. All driver features are functional and nothing is overbearing. Sight lines are more than acceptable. Even though the car is currently over 15 years old, I could see myself driving it for at least 5 more years. It really is one of those cars that you can drive until the wheels fall off. Internals are easy enough to source parts for and it contains no rare/hard to obtain parts. Overall a quality car, especially for the price. I honestly love my 2004 model Chevrolet Monte-Carlo. I bought my car used so it did have a few dings and broken features such as my gas and heat gauges no longer work. It does however have a great air and heating system. It also no longer has a working radio but I compensate with a speaker that connects to my phone. It also has a few cosmetic problems such as dents and scratches that could be repaired if I wished to do so. Over all a very nice and dependable car that I would recommend to everyone. 2000 Chevy Monte Carlo ss, near bulletproof but the ride is a little stiff. Over all I really enjoyed this car. My mom bought it new and I purchased it from her about 7 years ago. The only big repair I have had to do is the replacement of the lower intake manifold gasket in 160, 000 miles. I change the oil, rotate the tires, and put gas in it and it keeps going great. The only thing I never liked about it is the stiffer ss suspension, I wish it was a little softer. 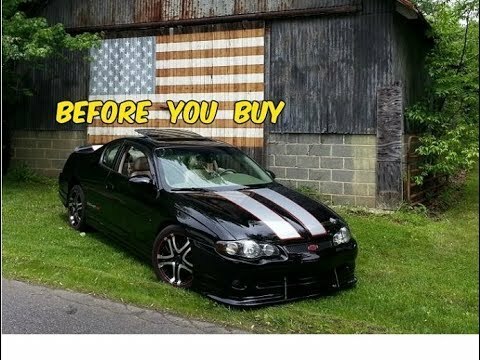 Does the 2001 Chevrolet Monte Carlo SS live up to its name? General Motors LLC (GM) is recalling certain model year 1998-1999 Chevrolet Lumina and Oldsmobile Intrigue, 1997-2004 Buick Regal and Pontiac Grand Prix, 2000-2004 Chevrolet Impala, and 1998-2004 Chevrolet Monte Carlo vehicles. The affected vehicles were previously repaired under recalls 08V-118, 09V-116, and 15V-201 to address the possibility that engine oil may drip onto the hot exhaust manifold. Engine oil that drips onto the hot surface of the exhaust manifold may result in a fire. The remedy applied under recalls 08V-118, 09V-116, and 15V-201 did not adequately remove the safety risk. GM is finalizing an improved remedy. Vehicles that are covered by recalls 08V-118, 09V-116, or 15V-201 that have not yet received the original remedy will instead receive the improved remedy under the original recall number, once the improved remedy has been finalized. The manufacturer has not yet provided a notification schedule. Owners may contact Chevrolet customer service at 1-800-222-1020, Buick customer service at 1-800-521-7300, Oldsmobile customer service at 1-800-442-6537 and Pontiac customer service at 1-800-458-8006. GM's number for this recall is 15757. Note: Until the improved remedy has been applied, owners are advised to park their vehicle outside since the fire risk exists even when the vehicle is unattended.